May and June offer two important trade shows and conferences for professional and personal service robotics: Innorobo, held in Paris May 24-26 and AUTOMATICA, held June 21-24 in Munich. Innorobo, which began as a regional show in Lyon, France, has become a steady and growing conference and show focusing on service robotics, has 100 exhibitors, and has changed its venue to Paris to handle that growth. Although far smaller than AUTOMATICA, Innorobo is highly focused on service robotics, startups and disruptive technological innovations — on social robots, mobil robots, AI and distributed intelligence for robotics, remote presence, commercial drones, and collaborative robotics. AUTOMATICA, is a massive trade fair for automation and mechatronics with a special focus on professional service robotics. 800 exhibitors, immense exhibition space, a 150-presentation symposium on robotics with speakers from both industry and science, covering service robotics, man-robot collaboration, machine vision, a Makeathon competition — everything related to robotics and automation. Excerpted liberally from The Robolution: Are We Walking the Talk? by Catherine Simon, Innorobo founder, President and CEO. 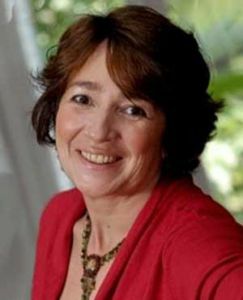 Catherine Simon, Innorobo founder, President and CEO. Professional service robotics involves B-to-B service robots (robots not assigned to manufacturing or production tasks, yet geared towards a professional market). The professional service robotics market was estimated at US$ 3.7 billion in 2014, a 3% increase compared to 2013. Consequently the “Robolution” is anything but exponential! Nonetheless, over the past 5 years, many of the products in this range have moved from the prototype phase to market-ready solutions. Admittedly, some platforms have managed to break into the market, for example “outdoor” robots – autonomous vehicles, exploratory robots and agricultural robots account for 37% of the market in terms of value and grew 25% between 2013 and 2014. This growth has been boosted by drones, namely in defense applications, and reflects the relative success of cow milking robots. Logistics robots account for 17% of the service robotics market in terms of value, showing 21% growth between 2013 and 2014; still a long way from transforming all service activities. Yet, medical robotics (35% of the market in terms of value, with a 9% decrease in growth between 2013 and 2014) enables safer surgical procedures and faster, more effective rehabilitation. It is one potential solution to the challenge of an aging population, it offers the prospect of new practices to treat diseases that have until now been incurable, and it may potentially eliminate the world “disability” from our vocabulary. At the same time, the “Hospitality” market in general is eager for solutions to increase productivity and improve customer service. Alongside this, robotics is making its first incursions in the distribution business with Pepper (by Aldebaran Robotics/ Softbank) as an ambassador at Nespresso stores in Japan, at a few Carrefour stores in France, at Oshbot in the US, at Lowe and Futurerobot stores in Korea, and at shopping malls and other public spaces. Personal service robotics has had two killer apps: the robotic vacuum cleaner and the recreational drone. This segment of robotics is a US $2.2 billion market in the United States, up nearly 30% in terms of value between 2013 and 2014. Two major categories of personal robots alone account for more than 99% of the market: robots that handle household chores – vacuum cleaners and lawnmowers – and educational and recreational robots. The year 2015 was highlighted by very high-profile fundraising for social robots – namely for Jibo by MIT’s Cynthia Breazeal, which raised over US $60 million and the scaling up of the Aldebaran/SoftBank Pepper robot which involved a joint venture between SoftBank, Foxconn and Alibaba. These robots are generating huge amounts of hype as precursors of what the companion robot could be in terms of Man-Machine interface. Still, their functionality is limited. One of 2015’s hottest Christmas gifts, with nearly a million units shipping out, was the recreational drone. China is the uncontested leader on this market, namely with DJI, though here again France has its national champion with Parrot. Wikipedia described robotics as a “General Purpose Technology,” a GPT, which can effect an entire economy and has the potential to radically change society through its impact on pre-existing economic and social structures. The examples of GPTs given are the steam engine, electricity, the automobile and, of course, the internet. It is clear that robotics technologies provide potential solutions to our major societal challenges. Precision agriculture is helping to save our planet, and robotics technologies applied to the energy, recycling and waste management sectors can transform the way we consume natural resources by optimizing our use and distributing it based on real needs. Medical and healthcare robotics can eliminate the word “disability” from our vocabulary and give new autonomy to our elderly citizens. The list goes on and on. In industry, do we really need to produce more at a lower cost or rather give humans back a sense of pride in their profession and know-how while making their work less physically demanding? While technology is a means, it is not there to give us meaning. Robotics technologies are going to continue to advance with, if we believe Moore’s Law, an “inflection point” in the next 10 to 20 years, followed by rapid progress, and with the aim to improve the lives of all citizens while preserving our planet for sustainable humanity.